Welcome back to The Dirtbags of Holding! This week, our heroes have to figure out what these random bits of tech they found even do! Then, how about that crazy forest eh? Welcome back to The Dirtbags of Holding! This week, we continue our campaign of Monte Cook Games' Numenera - our characters run into some trouble as they begin to explore The Beyond. Welcome back to The Dirtbags of Holding! 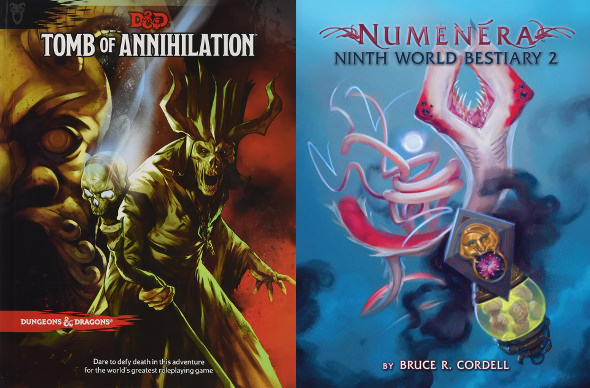 This week, we start our campaign of Monte Cook Games' Numenera by introducing our characters and setting them off upon a quest. What awaits the Dirtbags in the Ninth World? Support our sponsor! Check out Easy Roller Dice for some great metal dice and gaming accessories! This week, I grabbed my friend Philip and we sit down to talk about our experiences this year at Gen Con! Lots of talk about the games we played (or didn't get a chance to play), the panels we saw, and the things that we saw. What was the coolest thing you saw (or wanted to see) at Gen Con? Next year, should we do a game to play in, or a panel where you can watch us play something crazy? Have you wanted to play a RPG with your kids? Then you will want to listen to this week's episode, where I sit down with Shanna Germain from Monte Cook Games to talk about "No Thank You, Evil! ", a role playing game designed for children. NOTE: in the episode we talk about the ENnies, but since this was recorded, "No Thank You, Evil" won the Gold ENnie for Best Family Game! Congratulations! If you want to pick up this game, then head over to montecookgames.com/store and use the code "boardsswordsaug2016" to get $5 off this game or anything else on their store.